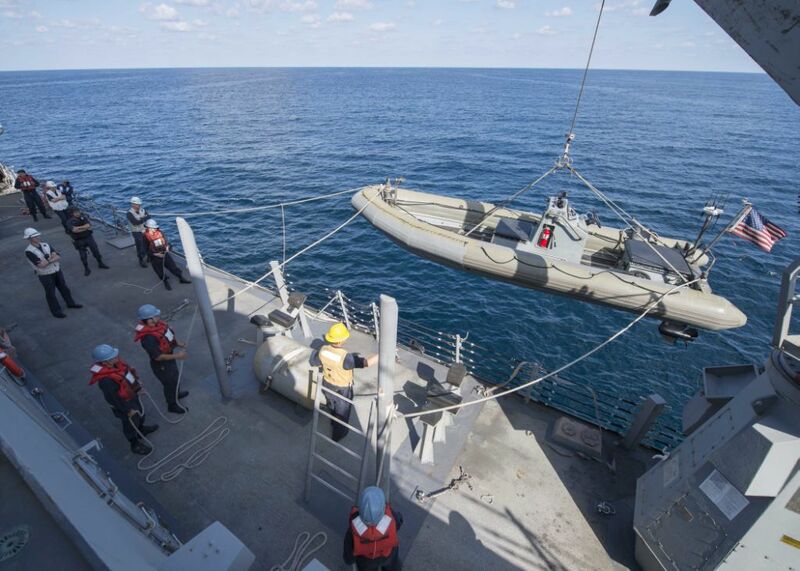 Sailors lower a rigid-hull inflatable boat from the destroyer USS Dewey during boarding operations. Warships, helicopters and maritime patrol aircraft from New Zealand, Pakistan, the United Kingdom and the United States have joined forces during Operation ‘Eureka’, a Combined Task Force 150 (CTF-150) counter-terrorism operation conducted in late February in the Northern Arabian Sea and Gulf of Oman. 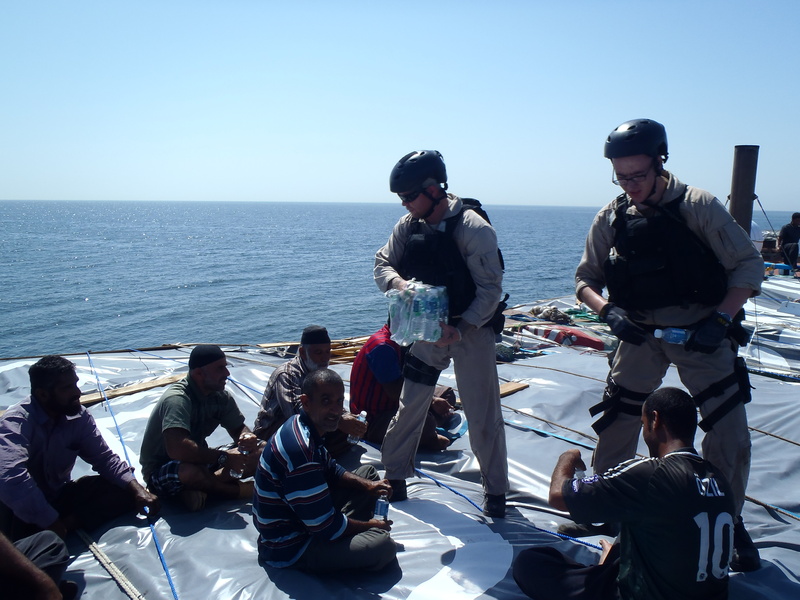 Members of USS Chinook’s boarding team offer water to the crew of a cargo dhow during a boarding operation. Similar to previous CTF-150 operations, Operation Eureka demonstrated the international resolve to deter and disrupt terrorist organisations from using the seas to move illicit goods, including narcotics, weapons and charcoal, to fund their activities. This operation, which surged resources into a specific area, was aimed at maintaining a heightened Combined Maritime Forces (CMF) presence in this important region, keeping shipping lanes open for commercial traffic and those using the seas for legal purposes. The participating warships were the US Navy patrol boats Sirocco and Chinook, the US destroyer Dewey and the Pakistani frigate Tariq. Sirocco and Chinook’s participation in Operation Eureka was the second time that ships from Patrol Coastal Squadron ONE have supported CTF-150 this year, with their sister ships USS Firebolt and USS Thunderbolt operating with the Canadian-led Task Force for five weeks earlier in January and February. As well as warships, the United Kingdom and New Zealand provided maritime patrol and surveillance aircraft, capturing imagery of potentially suspicious activities on the high seas from the air and transmitting this information ashore for analysis.